RICHMOND, VIRGINIA -- Attorneys for President Donald Trump appeared in court Tuesday to argue against claims that the president violated a constitutional clause that prohibits elected officials from doing business with foreign governments saying that attorneys general from Maryland and Washington, D.C . don't have the authority to sue him. The attorneys from the Department of Justice representing President Trump on Tuesday argued that there is no authority to sue the president in his official capacity because of the office he holds - saying he is unique and immune from the matter. "The president is unique in the Constitutional structure" Justice Department attorney Hashim Moopan said Tuesday in appellate court in Richmond, Va. citing "fundamental defects" in the case. Judge Dennis Shedd, a member of a three-judge appellate panel, pressed on this pointing asking: "Somebody has to be there to hold him accountable?" "What do you do then? Where's the check on the president?" the judge asked. 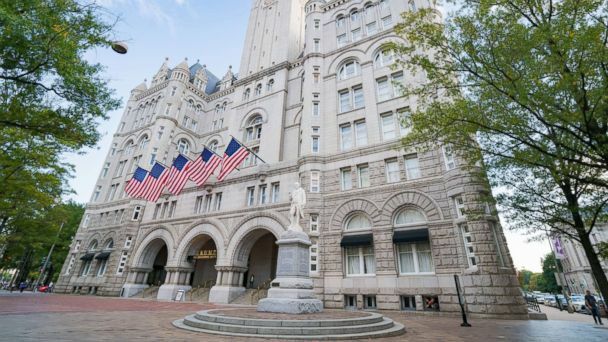 Moopan argued that the idea that foreign persons stay at the Trump International Hotel because the president owns it and want to show favor is "too speculative." When asked by Judge Marvin Quattlebaum if there's anything the president can do to address these concerns over emoluments, Moopan replied he would need to resign from office. "The only thing he can do would be to resign from office....or divest his financial interests," Moopan said. Attorneys arguing on behalf of Washington D.C. and Maryland disputed the notion that you can't sue the president but had a tougher time answering when pressed what relief they thought was appropriate for the issue - if it was putting the money into a blind trust or full divestiture. Solicitor General Loren AliKhan said it's "hard to say" at this point what solves it because it depends on the facts on the ground. "I don't think it's hard to say," Judge Paul Niemeyer shot back. "Divestment is the clearest option," AliKhan said.